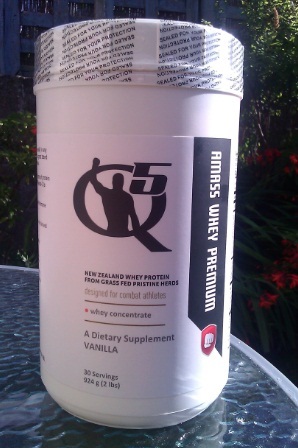 Short Review: Q5 Amass Whey Premium is easy to use and tastes ok when mixed in a smoothie (the option I used was two bananas and some water along with a scoop of Q5 Amass Whey Premium). I wouldn't particularly recommend just mixing it with water, although the taste is bearable. As far as I could tell it did aid recovery, but I should note that I am almost completely ignorant of supplements and don't do any exercise outside of BJJ. I therefore found it difficult to tell if my recovery had in fact improved or not. At £35 in the UK or $50 in the US, Q5 Amass Whey Premium is not cheap, but you may or may not feel that extra cost is justified by the fact it is produced in New Zealand rather than China or India, given the difference in the dairy production process. Available here. Full Review: I am far too lazy to be a body-builder. While it's a fascinating sport which takes an incredible amount of dedication and discipline - I would still say that Pumping Iron is the greatest sports documentary ever made (though I guess the fictional elements in Pumping Iron complicate its status as a documentary) - it doesn't take long before I get bored lifting weights. So, when Q5 Labs got in contact with me about reviewing one of their supplements, I did what I always do in that situation: direct them to Will Wayland over at Powering Through. As you can see from Will's reviews, he knows his stuff. However, Q5 were still keen to send me something despite my protestations of ignorance, so I said that now I'm past 30 I wouldn't mind help with recovery. I was a bit surprised to receive a big tub of whey protein: this is a product you've almost certainly encountered if you're involved in any type of exercise. It tends to come in massive tubs of white powder, provided by an equally enormous range of different companies. Googling 'whey protein' brings up almost 18,000 shopping results. For the body to return to its optimal condition following exercise it needs to go through a three-pronged process of rehydration, refuelling and reconditioning. Whey protein is considered a superior high biological value protein for muscle recovery, as it contains a high natural concentration of branched-chain amino acids (BCAAs), which are necessary as building blocks for the synthesis of new muscle proteins. That all sounds beneficial, though as she's writing for a dairy industry publication, bias is more than likely. There is a small chance that you may have issues with your liver when it comes to taking whey: friends of mine have mentioned that they stopped taking whey protein due to that concern. Given that none of these friends were scientists, I had a quick look around to see if there was anything to back up those worries. According to this, combining whey protein and creatine can be dangerous, but it looks like just one case, which isn't exactly conclusive. Nevertheless, if you have liver problems, then that's probably something to look into. 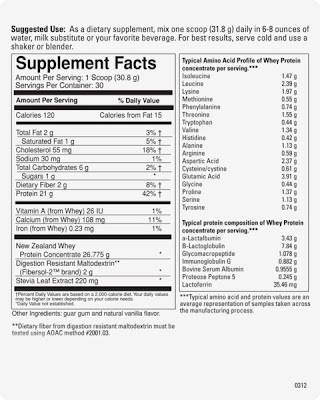 Whether or not your liver will have genuine problems with whey, there are some warnings noted on the product itself. Right on the tub, it says "if you are pregnant or nursing, consult your healthcare practitioner before taking this product." 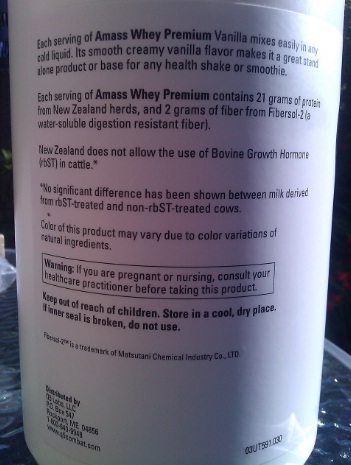 Also, if you have any issues with milk, then you'll also want to be careful, given another part of the Q5 Amass Whey Premium tub says "contains milk and soya". Click on the picture to see a full list of ingredients. the links with muscle tone and weight loss exist only when exercise is fairly intense, consistent and includes resistance work (such as weight training) and aerobic work of a reasonable intensity (running or cycling with fast bursts). If you opt for whey protein shakes… above your normal diet, then you will gain weight if you are not increasing exercise. Natural foods such as milk offer a complete health package of protective nutrients that you don't get in supplements. A 200ml glass of semi-skimmed milk contains 3.6 percent protein and about 20 percent of this is whey protein. Male-oriented fitness supplements are not hard to find, but they are hard to figure out. Top-selling products like creatine, whey powder and nitric oxide are widely available under many brand names at drugstores and chains like G.N.C., but they are also minimally regulated, with a majority going untested by the Food and Drug Administration. And that, sports medicine doctors say, points to the problems: there is little or no uniformity among products, the labels are confusing and the ingredients are arcane. Often, the main active ingredient is simply caffeine. Of course, neither of those are peer-reviewed science journals and I'm not a scientist. However, scanning through the list of more reputable academic articles which didn't contain too many long chemical terms I don't understand, it appears several studies support the idea that whey is healthy. I've put up the references at the end for those of you who do have the relevant scientific background to fully understand those findings. Titles like 'Whey protein enhances normal inflammatory responses during cutaneous wound healing in diabetic rats' and 'Dietary whey protein decreases food intake and body fat in rats' would seem to indicate positive benefits (at least for rats ;p). Whey protein concentrate (WPC) and whey protein isolate (WPI) are obtained by reducing the amount of non-protein components through selective membrane filtration. Sweet whey is the whey obtained from the production of Cheddar-style and Swiss-style cheeses, while acid whey refers to whey that comes from the production of either ricotta or cottage cheeses. Acid whey has a slightly lower pH, which can make it more useful in certain applications with a savory flavor profile, such as snack foods and salad dressings. 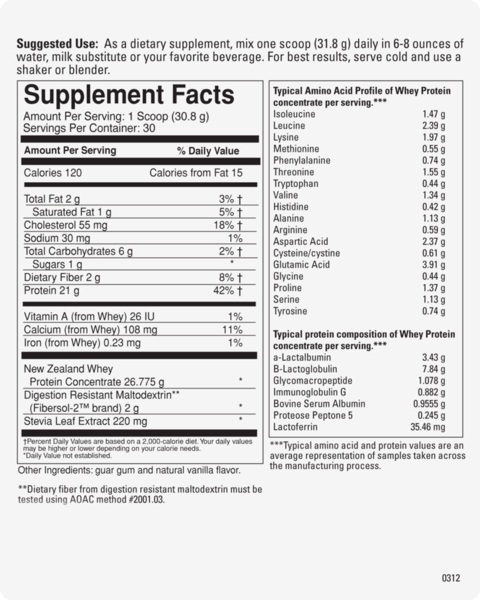 Other whey ingredients may feature a reduced-lactose or reduced-mineral content. In addition to whey being great for rats, looking around the internet and newspapers, there are all sorts of other claims about its benefits. The most extreme is that whey might help prevent cancer: The Independent article claims an Ohio State University study found that whey protein boosted glutathione, which is apparently "known to help control cancer-causing free radicals." It also notes that Susan Fluegel at Washington State University found it could reduce blood pressure. The main alleged benefit is building muscle, hence why adverts for whey protein are particularly ubiquitous in magazines with pictures of muscular men. Whey has a long history: The Independent says it was originally recommended by Hippocrates, while this site cites Galen as another advocate. Much more recently, it became popular with body-builders, then in the last couple of decades, whey protein has become mainstream. The Independent notes "the likes of Gwyneth Paltrow are consuming whey protein shakes as part of their detox regimens". In Beverage Industry magazine, there's a jargon-tastic quote from Starla Paulsen, who says: "while still popular amongst sports enthusiasts, protein beverages are also consumed as a weight management product or simply as a wellness beverage. Because of this move towards the mainstream, consumers are also demanding higher quality beverages with improved flavor and mouthfeel, as well as nutritional value." Speaking of taste and 'mouthfeel' (which the internet tells me is a real word, in use since at least 1951), the Q5 Amass Whey Premium I had was described as 'vanilla'. Mixing a scoop of it with some water results in something that doesn't taste great, but it also isn't face-scrunchingly horrible. If you're not careful to mix it thoroughly, the 'mouthfeel' is a little unpleasant, as there will still be little bits of congealed powder in the drink. You don't need to worry about measuring it out, as a scoop is included. I didn't actually realise that at first, because the scoop was buried in the powder. I was initially using a spoon and had assumed the hard thing I kept hitting was compacted powder. It was in fact a scoop. D'oh. 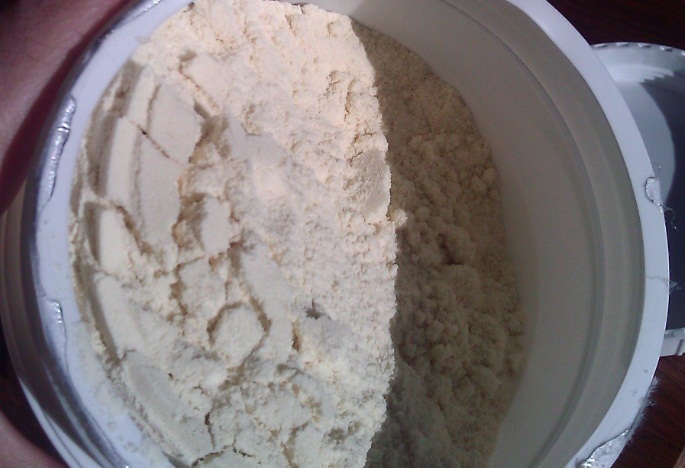 From my experience taking Q5 Amass Whey Premium over the last few months, the best option is throwing two bananas and some water into a blender then adding a scoop of the whey protein powder (no doubt there are much more complex options, but I found that one cheap, easy and quick to make). The vanilla tastes pretty good alongside the bananas, and because it's been through a blender you don't get that congealed powder at the bottom. I also tried Q5 Amass Whey Premium in some porridge, mixing a scoop with the milk beforehand. That also worked ok, although I don't know if the heat has any kind of negative impact on the whey protein. The taste wasn't especially different from when I normally have porridge, though I think the vanilla helped with the sweetness (I would usually dump a load of sugar on the porridge. No, I'm not a very healthy eater. ;D). It is difficult for me to judge if it has been of major impact to my recovery. I have had some soreness in my legs and fingers as normal, which possibly was a little reduced, and I've definitely got some soreness by my groin. In my case I tried taking Q5 Amass Whey Premium at various times of the day to see what happened, but the recommendation is to take it within an hour after exercising. Still, I did find a two hour Zumbathon I did a while back quite easy and had no soreness, but then I'm used to dancing around like a crazy person. The real test was the 24 hour GrappleThon, which is why I delayed this review until after the event. I wanted to see if taking Q5 Amass Whey Premium in the weeks leading up to the event and directly afterwards would help my recovery. I am a bit sleep deprived, obviously, but all things considered I'm not feeling especially sore today, which is the day after the event. My calf was slightly sore in the morning, but nothing major: I had no difficulty doing my usual 20 minute cycle to work, which is up some steep hills. I know you’ve tried lots of protein mixes, so have I. My favorite used to be the red jug at Cheap-Mart. If I was there for something else I’d grab a tub for $26 and call it good. But that was before I knew that most of the big brands source their whey from China and India to keep costs low. Both places are known for weak regulations, suspect food ingredients, rampant environmental pollution, and terrible working conditions. China in particular has a history of adulterated dairy products. That's why we source 100% of our whey from New Zealand, home to some of the purest dairy production facilities in the world. New Zealand has strict laws in place to protect the quality of both the dairy products and the health and welfare of the animals. Growth hormones for cows like rGBH are completely outlawed, same with antibiotics. It's certainly true that China and India don't have a reputation for fantastic working conditions, though I know just as little about economics as I do about science. Whether or not it is true that the methods used in New Zealand are vastly superior (I suspect that they are, but I don't know enough about dairy production facilities), then you may feel that is not an unreasonable justification for spending a bit more on your whey protein. You can buy Q5 Amass Whey Premium Protein here. Ebaid, H., Salem, A., Sayed, A., & Metwalli, A. (2011). 'Whey protein enhances normal inflammatory responses during cutaneous wound healing in diabetic rats', Lipids In Health And Disease, 10235. Good review as always. You may also be interested (or maybe not) in Vega Sport, which is a plant-based alternative to Whey powders and is recommended by a number of athletes, especially the vegan or more health-conscious ones. It is, however, rather expensive. Nice review Slidey! Nice to read a review from someone with no real vested opinion. Im totally jaded by Whey supps with most reviews coming down to taste and mixability alone. Just a few points that you raised. RDA's for protein are junk as recent research suggests that people who consume additional protein can result in improvement body composition. Obviously anything taken an extreme can be bad. Sports nutritionists always bring up milk as an alternative, but milk also contains fat and lactose which can not be conducive to body comp goals. Mainstream media has disdain for strength culture to which whey and supplements are attached so mainstream articles on the subject are generally met with derision by strength and conditioning professionals.